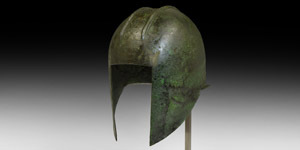 A bronze helmet raised from a single sheet, the bowl of domed form with two parallel corrugated ribs to the upper face, rectangular slot for the face, short flaring neck-guard developing behind the cheek-protectors. 836 grams, 24cm (9 1/2"). Fine condition, some restoration. Property of an Oslo gentleman; formerly in a Norwegian arms and armour collection; previously with Numisma Mynthandel, Norway; acquired from a Mayfair gallery, London, UK, in 2007; previously in the private North American collection of Bruce Ferrini, Ohio, USA. Cf. Bottini et al. Antike Helme. Handbuck mit Katalog, Mainz, 1988, pp.382-8, nos.5 and 6; for a finer example of such a helmet from the collection of the late Christos G. Bastis, see Sotheby's New York, 9 December 1999, lot 79. A horse-hair crest would have been fitted between the ridges.